This article is about the ship that was sunk when it was attacked by King Calamari in Super Mario RPG: Legend of the Seven Stars. For the ghost ship that appears in Super Mario World, see Sunken Ghost Ship. 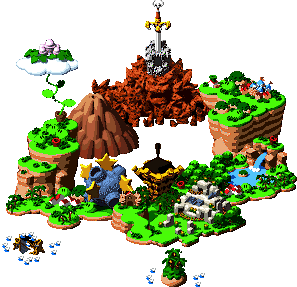 The Sunken Ship appears in Super Mario RPG: Legend of the Seven Stars. This ship supposedly sunk when the giant Blooper, King Calamari attacked it. Before the ship sank completely, the crew managed to seal King Calamari in the treasure room. The upper portion of this ship is filled with undead enemies like Dry Bones and Greapers. 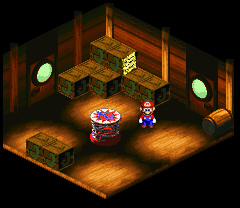 There are also several puzzle rooms in this portion. There are several puzzles and riddles that, when solved, reveal part of the password needed to open the treasure room. The lower portion of the ship is almost completely submerged and filled with territorial sea creatures. This portion of the ship is ruled by the infamous pirate shark Jonathan Jones and his crew of Bandana Reds and Blues. In the Japanese version of the game, the password to get to King Calamari is すいぞくかん (suizokukan, Japanese for "aquarium") instead of "Pearls." This page was last edited on April 5, 2019, at 21:42.